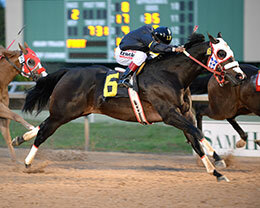 Ivan James, under jockey, Luis Vivanco, cruised to the fastest time for the Grade 2 Sam Houston Derby on Friday night. HOUSTON, TX�APRIL 1, 2016�Ivan James returned to the races Friday night with a solid effort while posting the top qualifying time for the $191,000 Sam Houston Derby(G3) at Sam Houston Race Park. The 10 fastest qualifiers will return to the Houston racecourse on Saturday, April 23 to vie for a winner's purse of $76,400. Making his first start since July, last year's Sam Houston Futurity(G2) winner Ivan James got a head-bob over Real Solid Oak in the first of seven trials. The pair dueled throughout to post the top two times respectively of :17.361 and :17.374 seconds, 104 speed indexes with a 17 mph tailwind. Jockey Luis Vivanco was aboard the winner. Trainer Angel Sanchez saddled the lightly raced son of multiple stakes sire IVORY JAMES to his third win from only five career starts. Owned-and-bred in Texas by Jorge Meraz, Ivan James has earning $285,552. The bay colt is out of the Dashin Bye mare First Dashin Bye. For the complete list of Sam Houston Derby finalists, times, sires, dams, owners, breeders, trainers and jockeys CLICK HERE.